We have been thinking of getting rid of our car for quite a while now. We had narrowed down a list of new cars that we could purchase. But since we had to move out to a place of our own, we fell a little short financially. Our alto was more than five years old and we did not expect much money once we sell it off. But once we posted an ad on Quikr, we got so many responses that we were surprised. Thankfully, we had registered for the QuikrNxt and hence we were not disturbed. The people interested in buying the car could text us and it was really convenient. We shared pictures of the car from every angle that the buyer requested. A guy even wanted to check the picture of the engine. Surprised and shocked that we were, we still clicked a picture and shared it with him. He seemed pleased and asked for some time to get back. QuikrNXT helped us keep a tab on all the buyers and callers. Since it has this feature of saving the conversations, we did not have to remember everything. It was all there in the app itself. It was such a help that I cannot be more thankful. Earlier when I had to sell my phone, my number was out there and I was getting so many calls that it began to annoy me. There were a large number of crank calls as well that troubled me. In two hours, I had to remove the ad itself! I wish QuikrNXT was available then, where I could just chat with people and negotiate the deal. The phone number being private is a huge bonus as well, as there would be no fake buyers showing interest in the product. I had close to around twenty five conversations saved on the app. So after I finished work, I would sit down and take a look at all the chats and decide what the best deal could be for me. In about two days I had the buyer come to my place and collect the car and go. Yes, it was the same guy who asked for a picture of the engine. We actually sold it for more than what we had expected in the first place. It was such a huge help. Since the budget for our car was slashed drastically after we moved out, the money that we got from the sale of this car was a welcome addition. Since the whole process was so quick and neat, we decided to pick up a used car only instead of going in for a brand new one. My husband and I searched for a good three days before narrowing down on a few options. We were keen on getting a Ford Figo and we found some really good ones available for sale on Quikr. We wanted only a black or a blue car and we were surprised to see many options available for that too. So my husband and I decided to share the discussions. He was given three people to get in touch with and negotiate and I was given three as well. Thanks to QuikrNXT we could talk to these sellers via chat from anywhere and anytime. I would have discussions during work as well as it was not that troublesome. Once we got home, we would sit back and check the chats to understand who offers the best deal. It was quite an experience and we enjoying talking to the sellers as they were so passionate about their cars and took great pains to sell it to the right buyer who would take care of the car the same was as they would. We also felt the same while we were selling off our car. We asked photos of the car from different angles to check that car has not been damaged any where. The last thing that we would want would be a dented or a scratched car. While we were content with everything, we told the seller that we would come to take a look at the car. We went the same day itself as it was not far away from our place. We scanned the car completely and once we were satisfied we negotiated the deal, and got an awesome one at that. We even got all the accessories included within the same budget. My husband and I were extremely happy with the deal. So within a week, we had sold off our old car and had purchased another one. And all within the same platform, Quikr. Thank you QuikrNXT for making it so easy for us to sell and buy anything that we want. 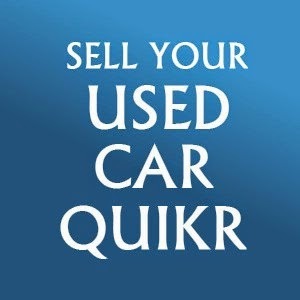 This post is written as an entry for Indi Happy Hours - Get a better Car with Quikr NXT! activity in association with Indiblogger and Quikr. :) it seems india is catching up on everything now .. we have our own Webuyanycar.com this side of the world..
there is another good thing that has started here now, you can get the Full history of the car by paying some money, just so you are sure the car has not been used in any unlawful activities etc, or if it had any accidents.. which is a great help .. I know! You get all the info you need.